Arab Suqrir - Where Was Arab Suqrir Located? One of the Villages/Cities of Gaza District, find here important information and profiles from Arab Suqrir. Where Was Arab Suqrir Located? 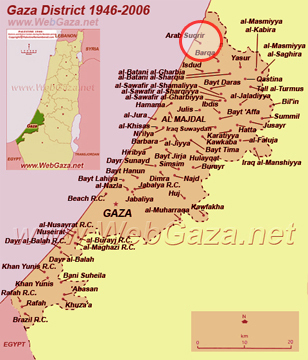 'Arab Suqrir is located in the northern part of Gaza District, north of Isdud, as shown on the map. It was occupied on May 10th 1948. The village was complety destroyed with the exception of two houses remain standing 'Arab Suqrir inhabitants were completely ethnically cleansed. Town's name through history was known by the Canaanites by Shakrun. 2 settlements are now located on this destroyed Arab Suqrir village’s land: Nir Gallim, and Ashdod. The site is overgrown with weeds, a few cacti, and trees. Two houses remain standing.